The Samsung Galaxy A40, which was released alongside the slightly-larger, but lower-specked, A20, is a middle-class smartphone that flexes some flagship-class muscles (ergo, pros) when it comes to selfies, but suffers from several off-putting cons hardware-wise. For starters, it comes with only 3100mAh of raw battery power , whereas its A20 sibling packs a robust 4000mAh battery. 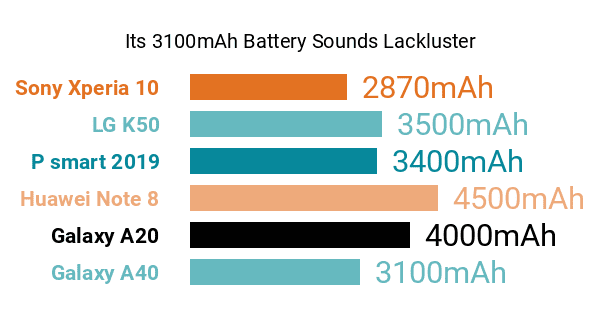 Furthermore, the best high-stamina smartphones on the market as we were reviewing its technical specs blustered with more than 5000mAh's worth of power. Adding to its slight flaws is its eight-core engine's 1.8GHz-only clock speed , if only because some popular octa-core contenders are powered by chips that clock in at more or less 2.5GHz. That being said, its 4GB accompanying RAM and 64GB memory expandable by up to 512GB both sound passable in our book. The biggest highlight of the A40's list of pros and cons comes in the form of a highly-competitive 25-megapixel f/2.0-aperture selfie camera whose raw pixel resolution overtakes those of some higher-class selfie-driven smartphones listed here on Phonerated. Also, it possibly fares well versus most of its rivals in the mid-range department, touting a 16- plus 5-megapixel dual camera , the sub-cam offering a 123-degree shooting angle that's obviously tailored to scenic shots and group photos. Also among the A40's features are a fingerprint scanner, facial recognition, and two SIM card slots. 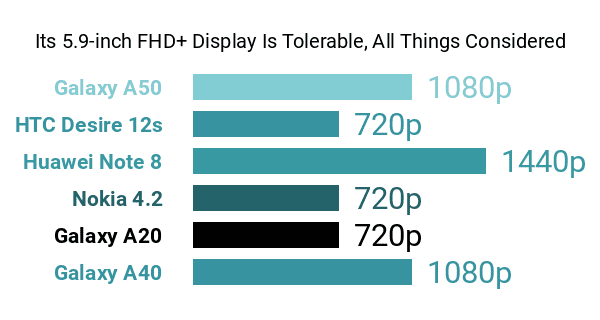 Rounding out its pros and cons is a respectable 5.9-inch Full HD+ (2340 x 1080) Super AMOLED Infinity-U display, with the rest of its exterior being coated in what Samsung calls a 3D glasstic finish. It is offered in colors like Coral, White, and Blue. Wrapping up, while the Galaxy A40 could have done better when it comes to hardware composition, it still likely appeals to shoppers eying a photography- and selfie-driven middle-class Android.